Summary: Bruce explains how revision can be taught as a tool to critique unjust texts. 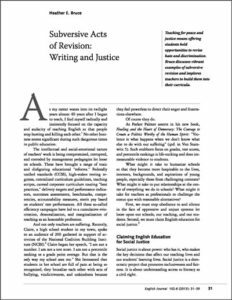 She writes, “We must …speak back to those who would take our power from us and continue a legacy of damage to our students.” Reading this piece could spark powerful conversations about teaching for social justice while supporting students as critically active readers who write as a way to resist and/or advocate. Revision in writing (and in life) results from a process of re-seeing. Revision is part of a process of clarifying how we express ourselves and not ‘a sign of failure’ (Early 84). It is a process of re-imagining, an ability to see otherwise. At the heart of revision is the act of looking for other possibilities and ways of envisioning. Revision is blind-sided when we disallow possibilities beyond common understandings. Revision reframes and reveals alternatives. Revision disarms and dissects. Revision expands our awareness and enlarges our perceptions. As Mary Ehrenworth and Vicki Vinton assert, ‘Revision is the opportunity to restructure, reword, play, plan and imagine it differently’ (19). Authentic revision leads to new ways of seeing, new insights, new inventions and developments. Revision lies at the center of reform; it rings particularly on a fervent desire for change. Revision, in this vein, leads to transformation. Revision as it pertains to learning about others makes our eyes see differently; we begin to look farther, to look beyond the self and one way of knowing and believing, to accept other ways of knowing and being. Revision pushes us to look at the same words, images, sounds, texts, people, animals, landscapes and see something completely different. When we study with profound concentration, we are able to see more intently and pause to light-step into wider understanding. Learning to re-see, to re-vise, in the deepest sense of the word, becomes exciting with possibilities when we begin to view the world through others’ eyes and to hear others’ voices. Our awareness of potential expands exponentially when we discover alternative ways of seeing, viewing, and interacting with the world through exposure to multiple perspectives, diverse cultural traditions, and unique individual narratives. Subversive acts of radical revision can stimulate civic dialogue and move us closer to achieving inclusive pluralistic values intrinsic to democracy.